The Silence is a 2019 English-language horror film released on Netflix and starring Kiernan Shipka and Stanley Tucci. It is directed by John R. Leonetti based on a screenplay by Carey Van Dyke and Shane Van Dyke that adapts the 2015 horror novel of the same name by Tim Lebbon. The film depicts a world under attack by creatures who hunt by sound. Shipka plays a late-deafened teenager who seeks shelter with her family, and a cult seeks to take advantage of her deafness. 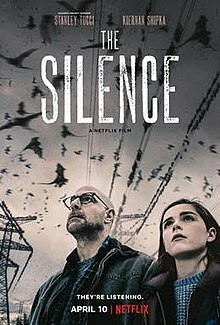 Netflix released The Silence on April 10, 2019. A cave research team unearths an unknown species of pterosaur-like creature, referred to as "vesps", from a mine. The vesps violently kill the researchers, fly out of the mine, and seek the noisiest areas. Ally, a teenage girl who lost her hearing in a car accident, lives with her parents Hugh and Kelly Andrews; her maternal grandmother Lynn, who has terminal lung cancer; her brother Jude; and their dog Otis. As the news of the vesp outbreak spreads, the US government declares a state of emergency and urges people to stay indoors and be quiet. Ally suggests they head to the countryside, which is likely to be quieter. Glenn, Hugh's best friend, joins them and brings his guns. They set out in two cars, but a man tries to hijack Hugh's car while refueling. Glenn shoots the man in the leg, and they drive away. The group hits a massive traffic jam, blocking all the interstates, and Glenn goes off-road. Speeding through the countryside, Glenn's car hits a herd of fleeing deer and tumbles down the embankment. He survives but is trapped in the car. Hugh and Kelly fail to free him, and Glenn asks Hugh to leave with his family. As the Andrews family return to their car, Otis barks, attracting the vesps, who attack the car. Glenn fires his gun, leading them away from the Andrews' car, sacrificing himself. To keep his family safe, Hugh is forced to let Otis out of the car; Kelly consoles Ally and Jude. Ally says they all have the skill to survive in silence, due to her deafness. Hugh leads his family on foot after setting Glenn's car on fire as a decoy. Lynn struggles to keep up, and her coughing puts the whole family at risk. Jude spots a house in the countryside. The family heads towards it and finds a high fence with a locked gate. Their arrival alerts the homeowner, who, unaware of the situation, speaks. Vesps attack and kill her. The family uses a storm drain to enter the house. A rattlesnake in the drain scares Jude, and he struggles to keep quiet; unfortunately, the sounds of the snake begins to attract unwanted attention, ultimately resulting in vesps biting into Kelly's leg. Hugh distracts them by turning on a woodchipper, crushing the vesps flying into it, and the family enters the house. While the others rest, Ally contacts her boyfriend, Rob, who tells her that his parents are dead. She also learns that religious cults have sprung up in the wake of the disaster. By morning, Kelly's wound is infected, so Hugh and Ally leave to find antibiotics. While at the store, Ally discovers vesp eggs growing inside corpses. Returning home, the tongueless reverend of a cult fails to recruit them. The reverend snarls as Hugh and Ally walk away. They return with the antibiotics, and Kelly recovers. Ally learns from the Internet that vesps can not survive in the cold. The reverend finds the family's hide-out and shows up with a group of his followers, asking for Hugh's family to join them. Hugh politely asks them to leave, at which point the reverend reveals his interest in Ally's fertility. Hugh brings out his gun, forcing the cultists to leave. Rob briefly contacts Ally, letting her know he is headed north to "the refuge". Hugh and Kelly wake up in the night and find a little girl at the door. After letting her in, they find she is a member of the tongueless cult. Phones strapped to her and placed around the house go off, attracting vesps. The cult members abduct Ally, but Grandma Lynn runs outside to help her. Lynn holds Ally's captors down and screams; vesps attack and kill her and the captors while Ally escapes. Other cult members take Ally at knifepoint. Hugh, Kelly and Jude fight back and kill most of the cult, though Hugh is stabbed. Several weeks later, the remaining Andrews family trek across America and eventually arrives at the refuge. Ally finds Rob, and together they hunt the vesps with arrows. Ally wonders whether the vesps will adapt to the cold, or humans will adapt to a soundless lifestyle, like she did. The Silence is based on the 2015 horror novel of the same name by Tim Lebbon. The film is directed by John R. Leonetti based on an adapted screenplay by Carey Van Dyke and Shane Van Dyke. Actors Kiernan Shipka and Stanley Tucci were cast in the film in May 2017. In the following August, additional cast members were hired. Principal photography began in Toronto in September 2017. According to the film's production notes, the creatures are named "Vesps" after the Spanish avispa, meaning wasps. Director John R. Leonetti said that research was done into other cave creatures in order to design the Vesps. "Their skin is translucent, they have wings and they fly, but they also crawl and lay eggs like reptiles ... A lot of scientific research went into the design, the creation, and the computer animation of the creatures, right down to the detail of every joint, every vessel, and every move they make." Netflix released The Silence on April 10, 2019. It will be released in Germany on May 16, 2019. Global Road Entertainment originally acquired in December 2017 the U.S. distribution rights to the film. The distributor had financial troubles, and in a failed attempt to avoid bankruptcy, Global Road sold distribution rights to various films, including The Silence, to Netflix. The review aggregator website Rotten Tomatoes assessed 21 reviews; it reported 15 as negative and 6 as positive, for an overall rating of 29%. It reported an average rating of 4.61/10. Scott Tobias, reviewing for The New York Times, called The Silence "niche-targeted dreck" where "only a quality cast and more generous production values can cover up the shoddy stitching". Tobias said despite the film's depiction of "a grand evolutionary struggle... every moment feels like regression". RogerEbert.com's Brian Tallerico said The Silence was "a dull retread of ideas explored more interestingly in other films and TV shows". He said, "'The Silence' is barely a horror movie, and that's its biggest problem. A horror movie needs stakes, and you just never feel them here." Hearing actress Kiernan Shipka plays the lead character, a deaf teenager who battles monsters. Shipka learned American Sign Language for the role, and director John R. Leonetti said in an interview, "She learned to sign for the film, and now she's flawless, like she's been signing her entire life. She seems to have an almost innate sense of what it's like being a deaf person." Deaf celebrities Nyle DiMarco and Marlee Matlin and other members of the deaf community criticized Leonetti for saying that Shipka learning to sign was synonymous with knowing the culturally deaf experience and for undermining deaf representation by casting a hearing actor. DiMarco also criticized Shipka's ASL grammar, and others pointed out plot holes related to her character being deaf. The Silence was compared to A Quiet Place, a 2018 horror film with a similar premise. The novel The Silence was published in 2015, and filming of the adaptation took place in 2017, at the same time as A Quiet Place. While The Silence was acquired by a distributor, it was never released in theaters and was later picked up by Netflix. Quartz's Adam Epstein said while the parallel productions were coincidental, he compared The Silence to mockbusters (low-budget films that exploit blockbusters), highlighting that one of its screenwriters, Shane Van Dyke, wrote several scripts for The Asylum, a studio that specializes in mockbusters. The novel's author Tim Lebbon admitted that the two films' similarities are "a little troubling" and defended the film adaptation of his novel, "There are similarities, of course, but I'm confident that the movie of The Silence will stand on its own." The Guardian's Charles Bramesco called The Silence "a shoddy remix" of A Quiet Place and said, "The Silence exists for the sole purpose of being digitally sorted into a list of recommendations For Viewers Who Liked Bird Box, though that classification would be more accurately clocked as For Viewers Who Liked A Quiet Place... the demographic they're really after would be something closer to Viewers Who Have Trouble Telling Similar Things Apart." Decider's Anna Menta compared the films, "The Silence is much darker and gorier than A Quiet Place," and found The Silence to look low-budget in production values. Menta said The Silence was started before the invasion while A Quiet Place was set fully after the invasion. She noted the criticism of The Silence for having a hearing actor as a deaf character and highlighted its additional elements, a teen romance and a religious cult. ^ Staff (March 29, 2019). "The Silence | Official Trailer [HD] | Netflix". YouTube. Retrieved March 29, 2019. ^ Lodderhose, Diana (May 12, 2017). "Kiernan Shipka To Star In John Leonetti's 'The Silence' From Constantin Film & EMJAG – Cannes". Deadline Hollywood. Retrieved March 15, 2019. Lodderhose, Diana (May 18, 2017). "Stanley Tucci Joins John Leonetti's 'The Silence' – Cannes". Deadline Hollywood. Retrieved March 15, 2019. ^ N'Duka, Amanda (August 29, 2017). "Miranda Otto & John Corbett Cast In John R. Leonetti's 'The Silence'". Deadline Hollywood. Retrieved March 15, 2019. ^ Southey, Alex (August 25, 2017). "6 movie and TV productions filming in Toronto this September". Daily Hive. Retrieved July 29, 2018. ^ Beck, Lia. "How 'The Silence' Creatures Stack Up Against That *Other* Movie About Not Making A Sound". Bustle. Retrieved 10 April 2019. ^ Collis, Clark (March 29, 2019). "Kiernan Shipka bats away an apocalyptic horror in The Silence trailer". Entertainment Weekly. Retrieved March 29, 2019. ^ Cranswick, Amie (March 10, 2019). "First poster for The Silence starring Kiernan Shipka and Stanley Tucci". FlickeringMyth. Retrieved March 15, 2019. ^ N'Duka, Amanda (December 14, 2017). "Global Road Entertainment Acquires Stanley Tucci-Starring Thriller 'The Silence'". Deadline Hollywood. Retrieved July 29, 2018. ^ a b Epstein, Adam (April 11, 2019). "Netflix thinks we won't notice if it just remakes 'A Quiet Place' with different actors and a new title". Quartz. Retrieved April 12, 2019. ^ "The Silence (2019)". Rotten Tomatoes. Retrieved April 24, 2019. ^ Tobias, Scott (April 12, 2019). "'The Silence' Review: Fleeing Winged Peril for a Quieter Place". The New York Times. Retrieved April 12, 2019. ^ Tallerico, Brian (April 10, 2019). "The Silence". RogerEbert.com. Retrieved April 12, 2019. ^ Roxborough (November 3, 2017). "How Deafness Is Adding Extra Scares to John Leonetti's Horror Movie 'The Silence'". The Hollywood Reporter. Retrieved March 15, 2019. ^ Cassidy, Elizabeth (September 18, 2018). "Director John Leonetti Criticized by Deaf Community for Upcoming Horror Film 'The Silence'". Yahoo! News. Retrieved March 15, 2019. Emmanuele, Julia (March 29, 2019). "Netflix's 'The Silence' Trailer Teases Kiernan Shipka's Horror Film As The New 'Bird Box' — VIDEO". Bustle. Retrieved April 1, 2019. ^ Stanley, Alyse (April 12, 2019). "Netflix's 'The Silence' gets blasted for butchered sign language, glaring plot holes". The Daily Dot. Retrieved April 12, 2019. ^ a b Fisher, Christine (March 29, 2019). "Netflix's 'The Silence' looks a lot like 'A Quiet Place'". Engadget. Retrieved March 29, 2019. ^ Liou, Connie (April 10, 2019). "Is 'The Silence' Like 'A Quiet Place'? The Netflix Film Doesn't Live Up To The Hype". Romper. Bustle Digital Group. Retrieved April 12, 2019. ^ Bramesco, Charles (April 10, 2019). "The Silence review – shoddy remix of A Quiet Place is a Netflix disaster". The Guardian. Retrieved April 12, 2019. ^ Menta, Anna (April 10, 2019). "Netflix's 'The Silence' vs. 'A Quiet Place': How the Films Compare". Decider. Retrieved April 12, 2019. This page was last edited on 25 April 2019, at 09:06 (UTC).